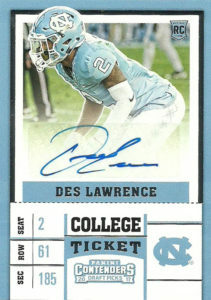 Des Lawrence got no respect playing for North Carolina. The 6’1″, 185 defensive back put up 175 total tackles, 8 tackles for loss, 1.5 sacks, 1 forced fumble, 29 passes defensed, and 3 interceptions for 29 yards over his 4 years playing for the Tar Heels. Projected as a zone corner with some skills, who could handle the rigors of the slot, Lawrence was not selected in the 2017 NFL Draft. The Lions however picked him up as a priority free agent in May. Before the preseason , he had an undisclosed injury and cleared waivers and reverted to the Lions injured reserve.